It was a gloomy, gray, dismally dreary, drizzling day that we woke up to this morning. What a fantastic day for a walk! We had slept in a bit and only headed out for some breakfast around 8:50am. We checked every bar in town but on a Sunday morning, the most that we could find was one open and selling coffee or beer. While Melanie had her coffee, I fought off the urge. After turning in the room keys, we only started walking around 9:30am. We had 20km to walk and it would all be on an empty stomach. I guess I can mention now that we have both been missing some sleep over the past several nights because of a cough I developed (spoiler alert – this might get gross – skip this paragraph if you don’t like descriptions of yucky things that come out of other people’s bodies.). Initially, the cough was productive and I was coughing up some pretty strange color of phlegm. Then one night, my left ear started hurting and I was pretty sure that the infection travelled there. That only lasted two days though and cleared by itself but the cough persisted despite medicine from the pharmacist. Then my right eye started weeping, turning blood red and discharging vast amounts of its own yellow-green goo. That couldn’t be good. I was afraid that I had full blown conjunctivitis. It never moved to the other eye though and has cleared up after three days. Now I just have to get rid of the cough. Melanie needs the sleep as much as I do and we are afraid to stay in an albergue and keep anyone else there awake. The drizzle that lasted most of the day, the later strong headwinds persistently coming at us and the majority of trail being rather rocky meant that we were always walking today with our heads looking at our feet. Every time we looked up, we either got a face full of water, our hat was blown off or we tripped. So I can’t tell you too much about the scenery except that it was fairly flat, bar the exit from Alcanadre and the entrance to Calahorra. It was also over back country lanes with a bit of blacktop, some compacted dirt portions but mostly rocky rutted roads. 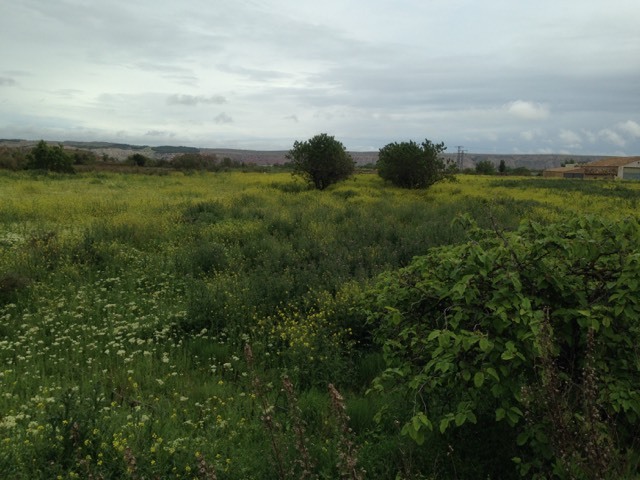 We were usually within sight of the train line or a highway, both of which we knew went to Calahorra. There were farms, orchards, vineyards and brushland on either side of the trail that still paralleled the same rail line as yesterday. There were lots of colorful wild flowers bordering the trail too. 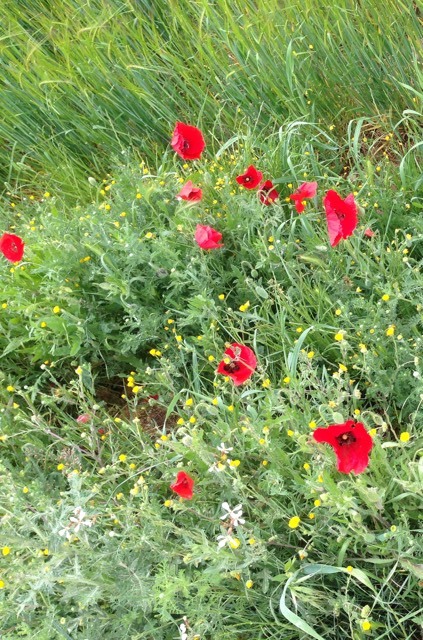 One particular flower we have seen in many patches of along the way looks to me like a poppy. I don’t know flowers but that brought to mind that yesterday was ANZAC day. So during today’s walk, I remembered my Aussie and Kiwi friends and together, we remember those who have served and those who have fallen. On a lighter note, at one place where we crossed a main road, I noticed a little furry ball that seemed to move a bit near the edge of the road. We moved slowly closer trying to figure out what it was. A large mouse? A small rat? A little chipmunk? No, the tail didn’t match up. As we got closer, it started to move – hop, actually – and his ears picked up. It was a tiny, drenched, baby rabbit! He started heading across the road but with cars coming, we herded it back to the grass. I hope it found its mom. Although we didn’t go through any towns between Alcanadre and Calahorra, we met quite a few people in each city and a couple in between. They are always curious and happy to see pilgrims but they do like to tell us that Santiago is the other way. 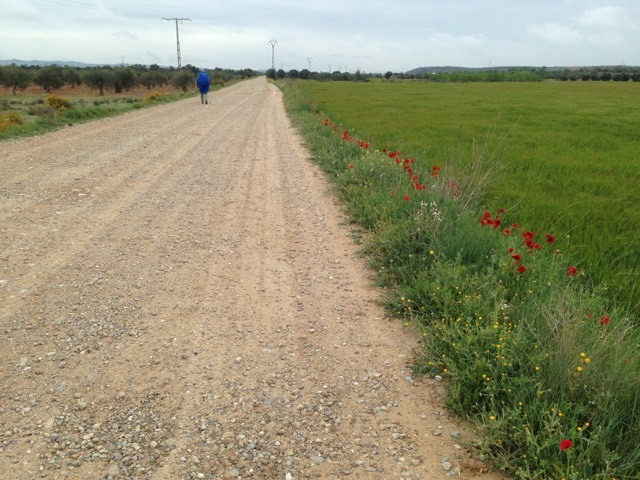 Most people in this area have never heard of the Camino Ignaciano but are excited to learn about it. They are also keen to point out that the way I have said Manresa since childhood is wrong. I must trill my “r” as if there were three or four of them together in the word and the “e” should be pronounced like the long “a” in “bay”. I have to hit my cheek to get the “r” right. For those following us, try to figure out the location of your planned bed before getting here. Calahorra is a big city (it is so big that it has its own Burger King!). We partially stumbled upon the Cuidad of Calahorra Hotel so we stopped there after a short lunch break at a bar up the road. It’s 59€ for a small room but with a great shower room and wi-fi. We’re going for a walk soon and if we stumble onto a albergue or hostel, I’ll try to get details. Finally, we heard the news about the earthquakes in Nepal and we are horrified. Keep the people there in your prayers, as we are doing. We greatly enjoyed our trip and hike there two years ago around this time and we remember the beauty of some of the landmarks that have been destroyed. The Nepalese are the kind of people that if you have no food and they only have three small pieces of chicken, they will insist on giving you two of them. They are a good people as are the members of the Indian Army who always work tirelessly in these disasters whether in India or a neighbouring country.